Rafting invertebrate species represent an important link for the dispersal and colonisation of islands in the Southern Ocean. They are sensitive to changes in hydrodynamics through effects on transport and food availability, particularly in the case of filter-feeding species. This gives them the potential to act as sentinels of environmental change. The rafting kelp-associated Gaimardia trapesina is one such species, widely distributed in the Southern Ocean. 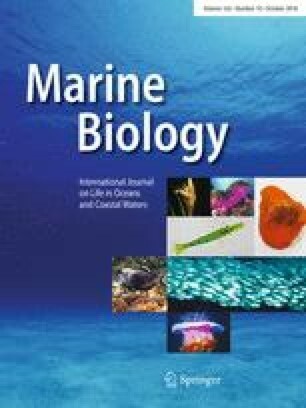 In 2015 and 2016, the size structure, diet, and distribution of G. trapesina were examined around the Sub-Antarctic Prince Edward Islands (PEI) to establish benchmark data and explore their potential use for monitoring long-term change. Gaimardia trapesina and its potential food sources were collected and analysed for size structure, attachment strength, and diet, using stable isotope and fatty acid analyses. The populations examined were dominated by relatively small individuals. The strength of attachment to kelp blades was low and the byssal threads showed high elasticity. The PEI lie in the path of the west–east flowing Antarctic Circumpolar Current and the highest abundances of G. trapesina were found on the downstream sides of both islands, while the species was absent from the western, upstream coasts. Both diet analyses and SIAR mixing models indicated that G. trapesina feeds on suspended particulate matter, while kelp particles contribute minimally to the diet. Considering the wide distribution of G. trapesina, its importance as food for birds and fish, and its sensitivity to environmental conditions, there is good potential to use this species as an indicator of environmental change in the Southern Ocean. The online version of this article ( https://doi.org/10.1007/s00227-018-3430-z) contains supplementary material, which is available to authorized users. This work was supported by funding from the South African Research Chairs Initiative of the Department of Science and Technology, the National Research Foundation, the South African Department of Environmental Affairs and Tourism, and the South African National Antarctic Program (SANAP). We acknowledge the Stable Isotope Laboratory of the Mammal Research Institute, University of Pretoria, and the InnoVenton and the Downstream Chemicals Technology Station of the Nelson Mandela Metropolitan University, where the analyses were conducted. Special thanks go to Captain Syndercombe and Captain Bengu, and the officers and crew of the SA Agulhas II for their tireless assistance at sea. This study was funded by South African National Antarctic Program (SANAP) awarded to Prof. Isabelle J. Ansorge, and by the South African Research Chairs Initiative of the Department of Science and Technology and the National Research Foundation of South Africa, awarded to Prof. Christopher D. McQuaid. All authors have declared that no competing interests exist. All applicable international, national, and/or institutional guidelines for the care and use of animals were followed. In addition, the permit to work on G. trapesina at the Prince Edward Islands was obtained by the Department of Environmental Affair of South Africa.